DURYEA, PA – Quantum Rehab® is pleased to announce that over 20,000 power chair users have adopted iLevel® technology, a global innovation in power adjustable seat heightx systems. 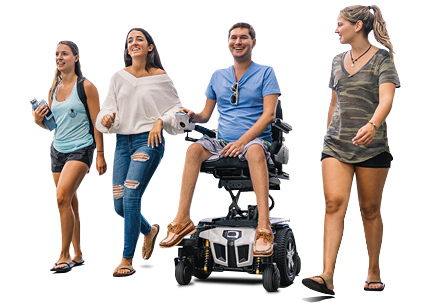 "When we launched iLevel almost four years ago, we sought to give complex rehab power chair users a better experience," said Jay Brislin, Vice President of Quantum. "Quantum’s exclusive iLevel technology offers standing-heightx seat elevation and a driving speed at 4.5 mph while elevated for real-world functionality. We've been humbled by the exceptional number of individuals who have shared how iLevel has revolutionized their power chair use." iLevel is an exclusive, patented power seat elevating system that promotes independence and social inclusion. As iLevel elevates, the power base reinforces stability electronically and mechanically to ensure safety at 12" of elevation while driving at 4.5 mph, an industry first! "For those of us who spend most of our lives using a power chair, it's beyond words to describe how much iLevel opens for me in independence, safety, and social interactions," said Alison Chancellor, a self-proclaimed "super fan" of iLevel on social media and long-time user. "I'm thrilled that so many of my peers have access to this amazing technology." Quantum Rehab® is a premier global innovator of consumer-inspired complex rehab products, including the Edge 3, 4Front®, and Quantum Series of power bases, iLevel® seat elevation technology, TRU-Balance® 3 Power Positioning Systems, Q-Logic 3 Advanced Drive Controls, and Stealth Products® positioning components. Please visit www.QuantumRehab.com.